Hopping to Target as Fast as We Can to Stock Up on Easter Decor – Starting at $3! This Spring, we’ve got Easter prep on our minds. 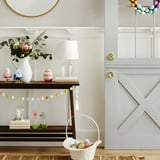 While egg painting and Easter brunch shopping are on our list of things to do, we’re mostly excited to decorate our homes from the inside out with Target’s fun and affordable Easter ornamentation. So welcome your guests (as well as the Easter bunny) into your home with decorations that not only brighten up your space, but also celebrate the joy of the season. Decorating for Easter applies to more than just eggs – shop Target’s festive home decor ahead! Previous articleTop 10 Things Dogs Eat (Other Than Food)!